Dog Walking Care Services take dog walking seriously. 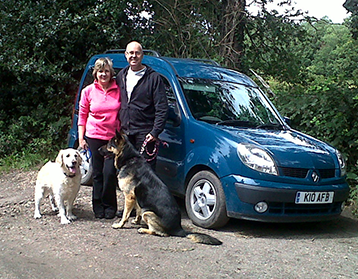 You can have your dog walked daily, weekly or on a regular basis to suit your needs. During the summer and other times of the year when it is hot I take a backpack with a large bottle of water and drinking bowls. We then stop for water breaks to help keep cool. Dog Walking Care Services offer home visits for your dog, giving fresh air and exercise whilst you are out. We can replenish their food and water, and provide plenty of love and good company. If your dog has any special requirements, such as medication, we can take care of that as well. Home visits will be for at least 20 minutes and will be tailored to meet your needs. They can provide stimulation during what can be a long day alone for a pet, if you cannot be there with them. If you have more than one pet, there is no extra charge, and if you have any other small animals in your home, we will happily look after them as well as part of the service. Dog Walking Care Services knows how important the transitional period is for puppies when clients have to leave their puppy for the first time to go back to work. It can be difficult for puppy owners to come back during the day to give their puppy the food and attention that they need. Puppies between the ages of 8-12 weeks will often require extra care and attention, for example feeding, as they require 3 meals a day, accidents cleaning up, toilet training, and companionship. Puppies' minds at this stage are like sponges, they absorb all that is going on around them and can quickly develop good or bad behaviours. Good experiences and socialising with people is so important at this stage as the experiences a puppy has during this stage of their lives can affect how they will cope as an adult. Once your puppy has had been fully vaccinated Dog Walking Care Services can start taking your puppy out for short walks, socialising with other dogs, people and the outside environment. During this time we can reinforce any training the dog owner has started. 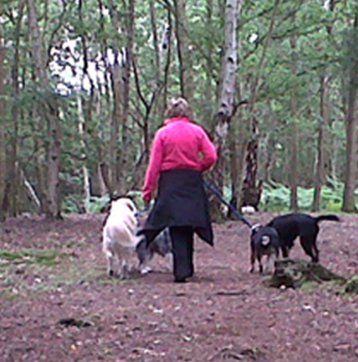 Once your puppy has become a juvenile or adolescent your puppy can join our group dog walks. This will reinforce good social skills and will keep your dog well exercised.